If you do not install these libraries and if you do not enable the libraries ingame in the addon manager, this addon can't be enabled and won't work! Please download and install the libraries manually or install/update them via the "Minion" addon manager. It allows you to save the current enabled state of all of your addons in an addon pack that you can give a name to. Then you can click on the name of any saved addon pack in the drop down box and it will reset the enabled/disabled state of each addon back to the state it was in when you saved it (enabled/disabled). You can save multiple addon packs. You can also click anywhere on the row (on the addon name or addon author area) to toggle the enabled state of the addon. Select/deselect whichever addons you want. In the Pack Name box type a name for the addon pack & click save. You can save multiple addon packs to be able to easily switch between different addon configurations. I often install other addons or works in progress to look at code for someone or often need to toggle my own addons ON/OFF as I am working on them. I got sick of having to deselect everything I no longer need running & reselect everything I want running when I am done debugging something. Fixed: Search bar will anchor to right corner of addon list now, even if you change the video settings to use a different monitor aspect ratio/size. Enter the search term into the edit box at the top right corner of the addon manager. Each time you press the RETURN key the next found addon will be scrolled into your view, and the found addon's name will be surrounded by some signs |> addonName <| with red color. -> These libraries need to be installed manually (like an addon) manually or e.g. by help of the addon manager "Minion". Many thanks to Solinur for the fix (as I could not rebuild it he was able to, and debugged it)! Hopefully fixed the automaticly disabling/non saving addons. 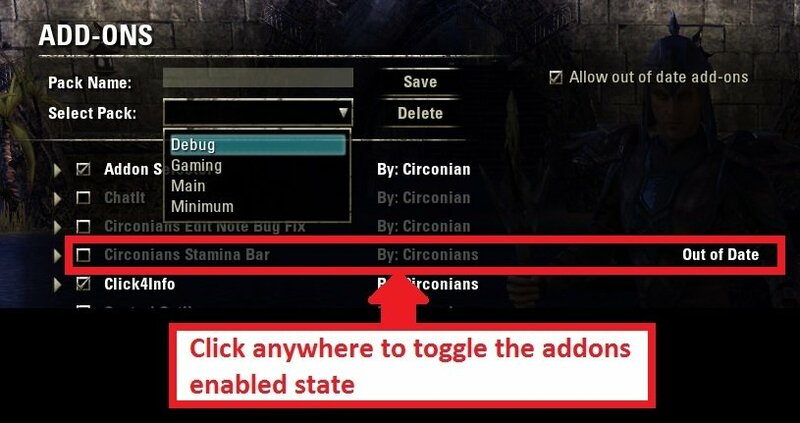 -Fixed compatibilty issues with "Votans Addon List"
You need to left click the name (not the checkbox!) of an addon to start and shift+click the name to end the selection. The checkbox value of the first clicked entry (start) will be set to all selected addons then. -> Known bugs: If you select too many addons some in between might not get changed properly due to dependencies to other addons etc..
And sometimes the selection does not work and nothing will be changed, or the selection gets inverted. Fixed: Lag after saving/updating packs. Code changes and improvement was done by "Votan"! Many thanks! The current ideas were "spyed" from the following addon "Addon Clearer"
-Added: Added keybinds/buttons below to Select all/Deselect all addons. If addons where checked as you press "Deselect all" the "Select all" button changes to "Re-Select saved" -> Which will select the addons again you have had selected before you deselected all. Fixed addon counter for enabled addons to not include disabled addons, which were disabled by missing/disabled dependencies. Added number of active/number of total addons to the title of the addon manager, upon request. Included translations for russian, thanks to user "Ckau"
Updated Toggle Added the ability to toggle addons by clicking on the row even when they are expanded to show addon description. "Reload UI" button The "Reload UI" button will now become visible when changes are made. Auto-Reload UI Added an option (in the AddOns panel) to automatically reload the UI when you select an addon pack from the drop down box. The default setting for this option is OFF. NOTE: In order to edit a pack this option must be OFF or else selecting a pack to edit would result in the UI reloading. Lib Files Removed unnecessary library files I left in the addon folder. Code Changes Lots of other minor code changes, has no effect on users. I did like that addon too. Though this one looks great too. I'm not sure if this is possible, but it would be great to be able to link addon profiles to game states. For example, have it detect when you're entering PvP or a delve/dungeon and auto load the appropriate profile. mby you know how i can import sets from that addon?? Looks like they're anchored in completely different places. Just run them both and transfer each set you have.